AHYIN by Micaela Ezra is a boutique collection of contemporary Judaica objects, designed and created with holistic, spiritual intentions. These pieces are made with love, great thoughtfulness and employ the highest quality materials. 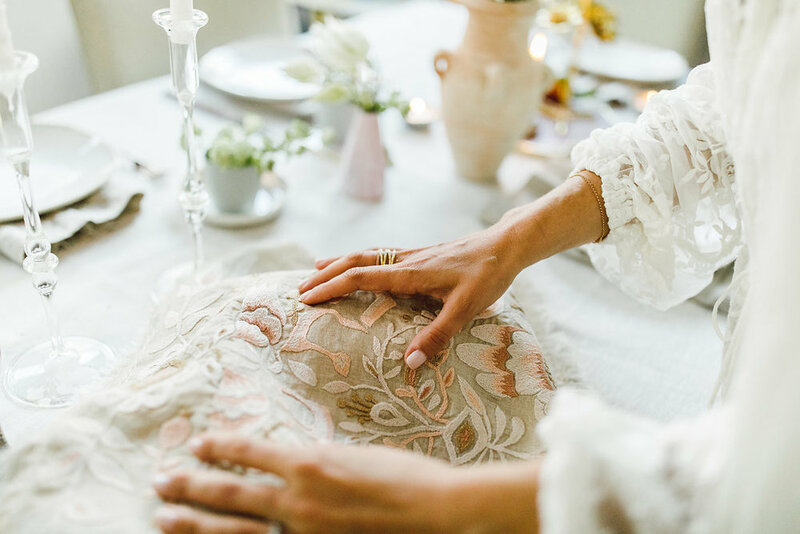 They are intended ultimately as heirlooms, but more immediately to stimulate conversation, to add beauty to tradition, and to enhance the experience of our rituals. The name AHYIN (pronounced Aah-Yin) comes from the Hebrew letter ayin, which is mystically associated with striving toward spirituality within the physical world. Read more here. Family & friends, tradition & heritage, spiritual introspection & learning, creating & appreciating beauty, compassion & thoughtfulness - these are the building blocks of my life. They are what enliven me. They motivate me when I wake up and they fill my days. These elements are also the building blocks of AHYIN and the lenses through which every piece is conceived of and made. At AHYIN we deeply believe in the relevance and essential nature of Jewish ritual. Every product is developed to enhance our experience and understanding of religious traditions. We also believe in quality design and construction and so we seek out the highest quality components, talented craftspeople and dedicated manufacturers. We feel incredibly proud to support indigenous talent and have a completely fair-trade and fair-wage practice. Ultimately we hope to bring to you something incredibly special and deeply meaningful, which will be enjoyed for lifetimes. We hope our pieces add meaning and blessing to your table. Learn more about Micaela and her other projects here. We are priviledged to work in collaboration with HILANDO MEXICO, a social and artistic collective, founded by Sally Azar in Mexico City. HILANDO MEXICO works to preserve traditional craft and provide income to a talented community of women in Ichmul “the place of little hills”, a rural town located in the state of Yucatan. Embroidery is a family tradition that the women of Ichmul learn from childhood; only thirty-two of them practice this work full time. They call themselves “Nicte-Há” a Mayan term meaning “Water Flower”. It is the heart-work and talent of these women that you see evidenced on your AHYIN textile, and we are very proud to support it. Every piece is embroidered entirely by hand, and takes three to four weeks to complete. We believe that understanding our traditions is what gives them their relevance and longevity. Every AHYIN product is accompanied by a beautifully printed booklet of original material, explaining the spiritual meaning behind the object and associated Mitzvot. Please read a sampling of our educational materials here. From yarn to packaging, we use only the finest quality elements for construction. Our 100% linen cloth is supplied by the illustrious LIBECO company - one of Belgium's oldest and most highly regarded linen mills. For embroidery we use 100% cotton thread. Since all our products are made and finished by hand, each piece will show subtle variations. We believe these add character and story, making every AHYIN product truly one of a kind.